In Washington the weekend of October 30th, the Snohomish County ACS/ARES and City of Everett ACS groups partnered to sponsor an ACES Basic course. 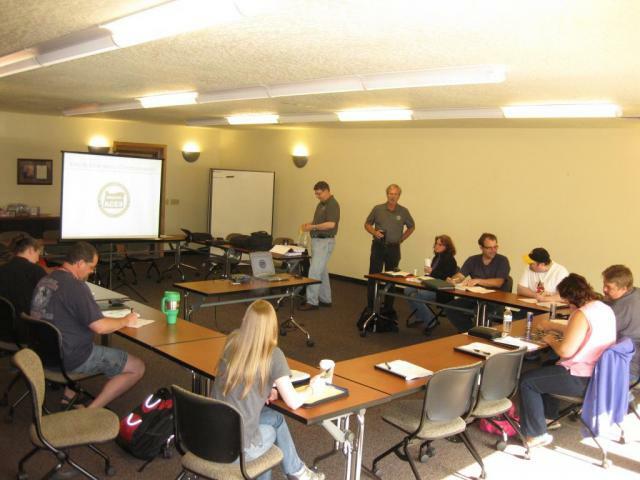 The course was attended by more than 30 students, and taught by a team of Oregon and Washington instructors. Participating agencies include Snohomish County ACS/ARES, City of Everett ACS, Federal Way ACS, Whatcom County ACS, Tulalip Tribes OEM, Blaine ACS, Puget Sound Energy ARES and Emergency Services Coordinating Agency RACES. Class started in Everett in the Providence Hospital conference room. After two days of instruction and practice, the class moved to Snohomish County Department of Emergency Management at Paine Field for the final day. Following the written test, the students were divided into smaller groups and evaluated on their ability to properly program their radio. The students individually set frequency, tone, offset and other parameters into their radios and demonstrated saving them into a memory position. They also demonstrated determining if a message is tactical or formal, and the proper procedure to send each one. Aside from individual evaluations, the group conducted several simulated nets where they checked in, listed their assigned simulated traffic, and sent and received at least one message. Following the course, a train the trainer program was delivered to enable local regions to take the ACES Basic course and teach classes in their own organizations. For a more detailed account of the course, see Brian Lawler's blog from Whatcom County. For more pictures of the event, see the gallery. This offering of the ACES Basic course will be Sponsored by the Nehalem Bay Emergency Volunteer Corps. For more information, contact Gordon McCraw. Click here to sign up to attend (pre-registration is required). Cost is $25, payable the first day. This weekend the first two Oregon ACES Basic Certification courses were held in Tillamook and Lincoln counties. Each was structured as a three-day offering with Friday and Saturday as classroom sessions and Sunday as the practical portion. With 11 and 12 participants respectively, a total of 23 people achieved their Basic Certification certificate. To see the pictures taken during the two courses, head over to the gallery. On Saturday, July 10, 2010, Oregon ACES conducted their second Auxiliary Communications Test (ACT). To date, we have reports from most groups, showing a total of 59 individual participants. The focus of this event was integration of non-ham communications resources (such as CERT) into the response simulation. The exercise was very successful, again garnering overwhelmingly positive comments and including more people than before. The full set of pictures is in the gallery. Contact Taylor K7TAY for more information. Click here to sign up. This course will consist of five weeks, three hours per night on Thursday. A weekend date for the practical portion of the course will be set within the first few weeks, to accommodate everyone's schedules. The fee for the course is simply to cover the production cost of the workbook. Click here for an overview of the material that will be covered. On Saturday, June 5th, Oregon ACES presented their program to the attendees at SeaPac. The material was well-received by members and leadership from both local and state level ARES/RACES groups in attendance. Two representatives from the Washington ACES group were there and explained their interest in the program and plans for the future. In addition to covering the details of the program, we also announced the dates of the first two course offerings in Tillamook and Lincoln counties. If you would like to attend either of these, go to the sign up page. During the presentation, we had a few "pop quiz" questions from the course material, and one "performance based" contest to see who could program the offset, tone, etc into their handheld the quickest. We gave away emergency fold-up J-Pole kits to the winners. It was a fun way to break up the presentation, and also demonstrated two things: 1) not everyone in the room knew the answers to the questions, and 2) everyone needs more practice programming the obscure functions of their radios! If you were unable to attend but want to get an Oregon ACES lanyard for your agency credentials, find a development team member and we will get you one. 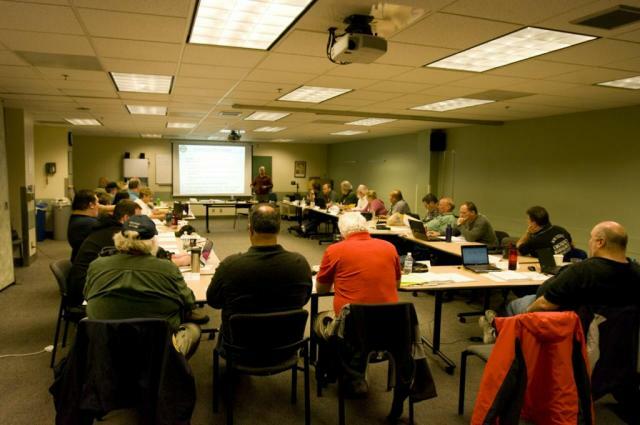 This offering of the Oregon ACES Basic Certification course will be headed up by Gordon McCraw (WX7EM), Tillamook's Emergency Manager, along with Michael Soots (KD7YPY) and Gary Mahan (N7IS). The course will be held at the Tillamook 911 center's conference room at 2311 3rd St. Registration is required, and there are still spots open. Click here to sign up if you wish to attend. Oregon ACES has caught the eye of the Oregon State Office of Emergency Management (OEM). A program such as this has the potential to have a wide-scale positive impact on the people providing the backup emergency communications that OEM depends on in a disaster. 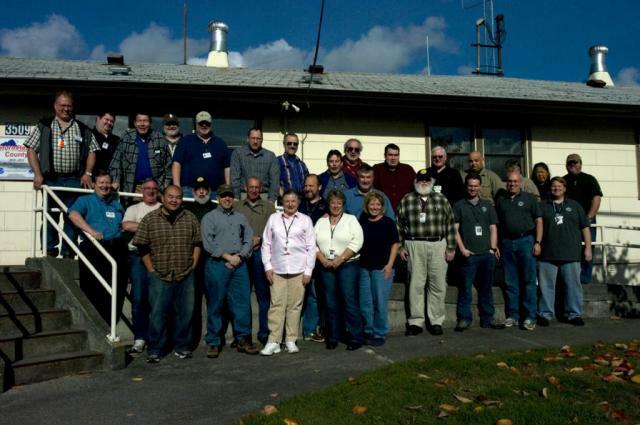 At the request of the office, Daron N7HQR and Gordon WX7EM (Tillamook County EM and ARES EC) presented the details, status, and future of the program on May 21, 2010. OEM director Ken Murphy said that he thought the program looked encouraging and that it would be a resource for county emergency managers. Oregon ACES conducted their first "Train the Trainer" event this weekend. The purpose of the meeting was to cover all of the classroom material with the first batch of instructors, as well as go over guidelines and procedures for teaching the course. We had at least two instructors from each of Tillamook, Lincoln, and Washington counties that were able to dedicate over sixteen hours of their time to this process. The process leaves us with a good batch of qualified instructors and we expect to announce some course offerings very soon! The Advanced Certification draft outline has been published and is open for public comment. You can help improve the quality and relevance of the material in the course by reviewing the draft and providing your feedback about what is good, bad, and missing. Anyone from anywhere can submit feedback and we invite everyone to do so.